Since heavy rains are predicted for tomorrow, we decided to take our trip as it a lot of walking and a boat trip. We left the apartment at 8:00 and got on a tram nearby and got off at the main train station (where we had arrived). 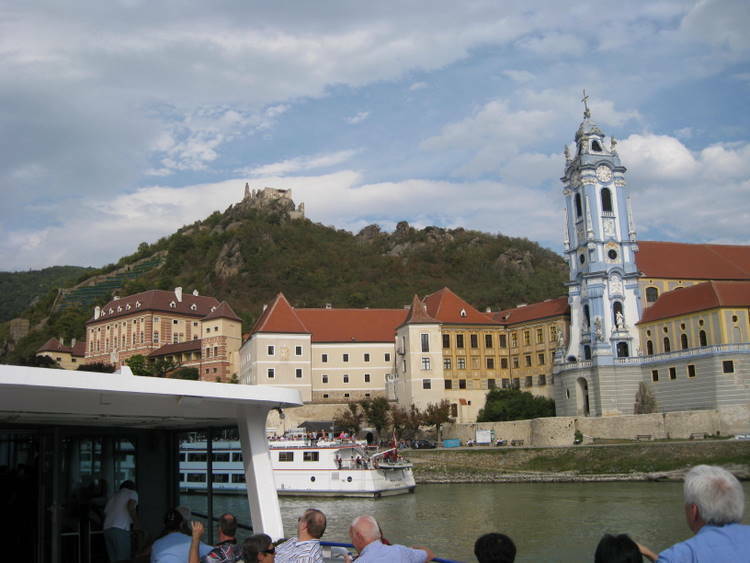 We bought a Melk Abbey Package which included train tickets, admission to the Abbey and the boat trip back. This was the first double decker train that we had ridden on this trip. The scenery was beautiful with the beginning of hills and mountains. The trip was a little over one hour. 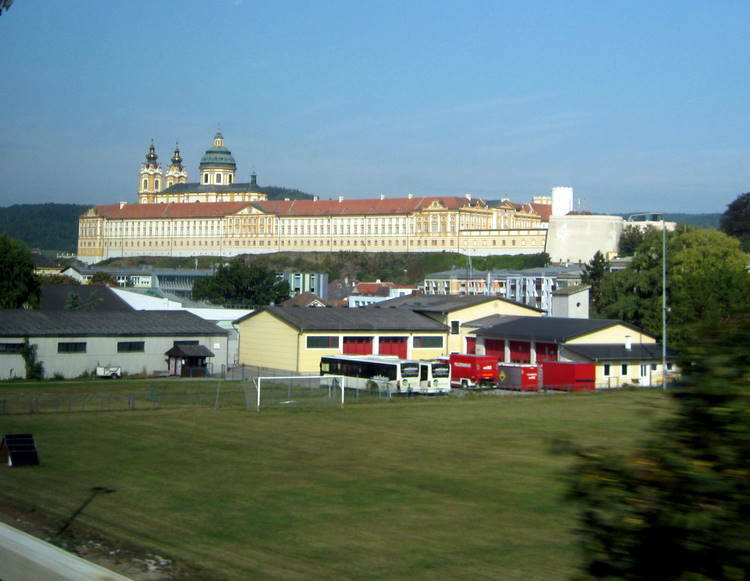 We could see Melk Abbey from some distance while still on the train. We arrived in the town of Melk which was very charming. We followed a sign for the information office but it was close. We found a set of steps up to the Abbey but they looked too step, so we decided there must be a better way. We asked several people, but they indicated that the steps were the only way. 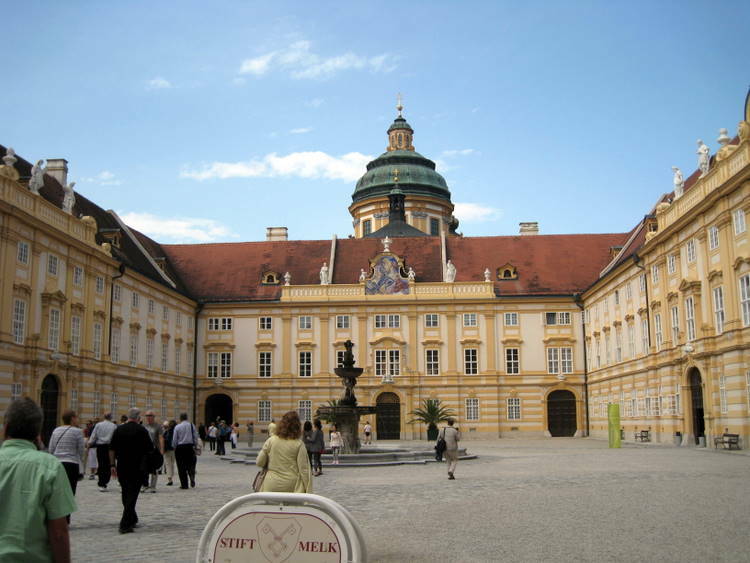 Melk Abbey is an Austrian Benedictine abbey, and one of the world's most famous monastic sites. The abbey was founded in 1089 when Leopold II, Margrave of Austria gave one of his castles to Benedictine monks from Lambach Abbey. A monastic school was founded in the 12th century, and the monastic library soon became renowned for its extensive manuscript collection. The monastery's scriptorium was also a major site for the production of manuscripts. 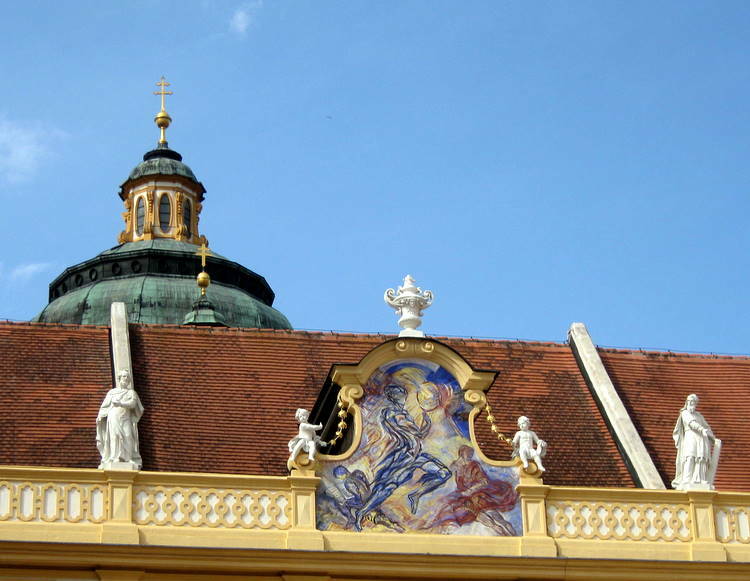 In the 15th century the abbey became the center of the Melk Reform movement which reinvigorated the monastic life of Austria and Southern Germany. Today's Baroque abbey was built between 1702 and 1736. 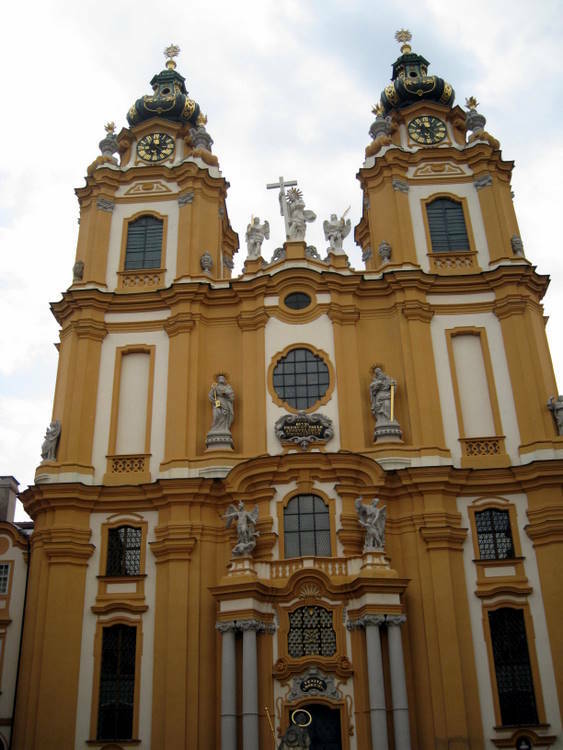 Due to its fame and academic stature, Melk managed to escape dissolution under Emperor Joseph II when many other Austrian abbeys were seized and dissolved between 1780 and 1790. 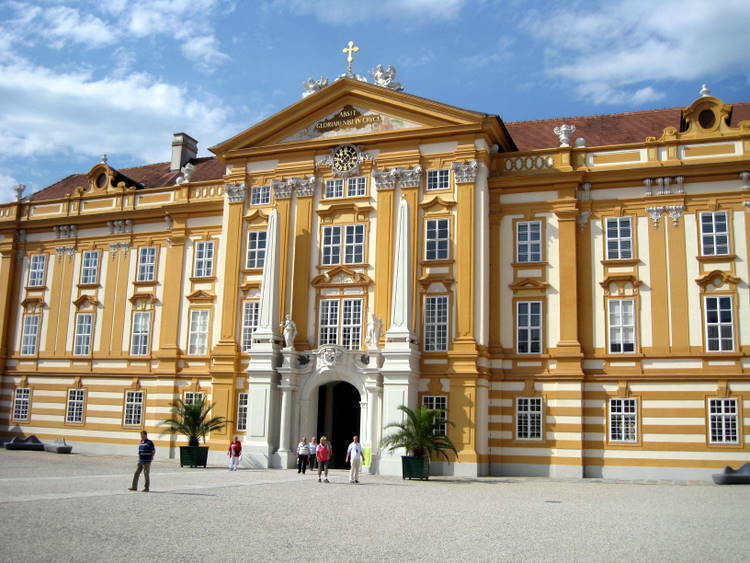 The abbey managed to survive other threats to its existence during the Napoleonic Wars and also in the period following the Nazi occupation that took control of Austria in 1938, when the school and a large part of the abbey were confiscated by the state. The school was returned to the abbey after World War II and now caters for nearly 900 pupils of both sexes. 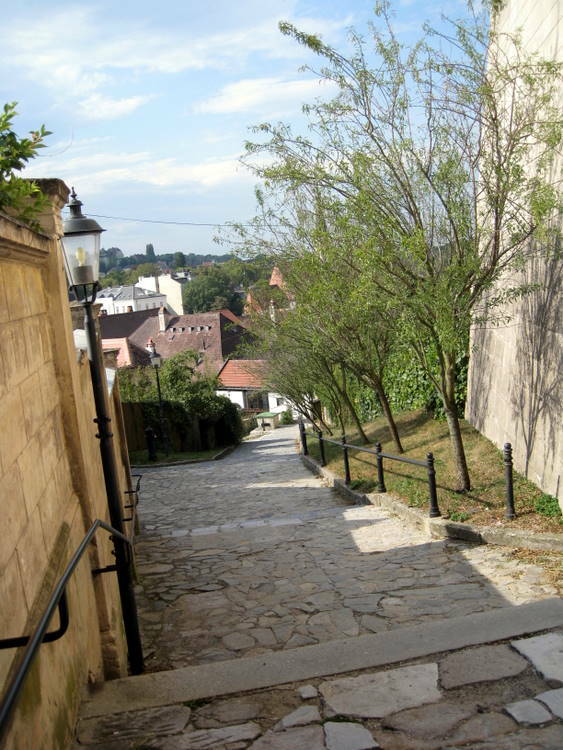 We had to climb up to Melk Abbey, but there were places where we could rest a bit. I was anxious to see the Abbey since I had made the model (SEE MY MODEL) l and had photographed my building of it for a special page under church models on my webpage. It is a huge and quite beautiful. We arrived in a courtyard in which was located a very nice gift and bookstore. Of course we had to stop and buy a book on Melk Abbey. We stopped in the ticket office to confirm our tickets. In front of us was the Eastern Façade which is the entrance to the abbey courtyard. The entire abbey is yellow with white trim and r eddish brown roofs. On the Eastern Façade, above the rounded archway in front of the middle windows on the second floor, is a small balcony from which the abbot used to greet guests. On pedestals on either side of the balcony are statues of Peter and Paul, the patron saints of the abbey. 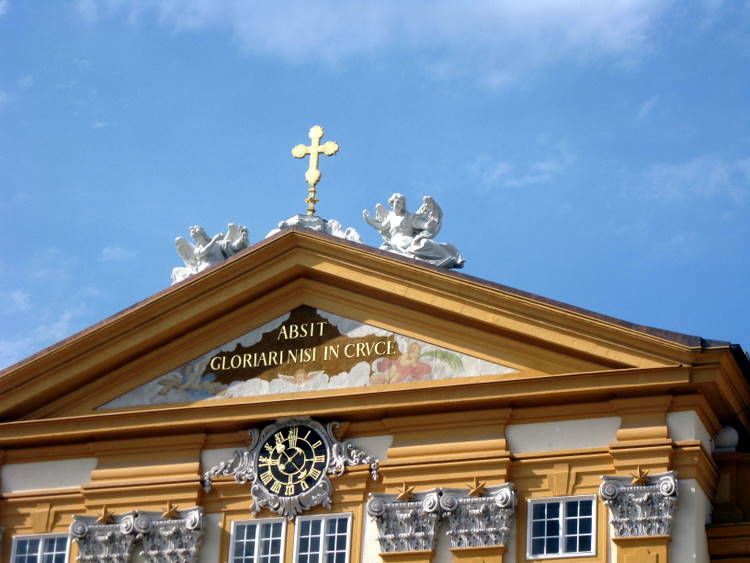 Under the top gable are the words: “Absit gloriari nisi in cruce” (Glory is only to be found in the cross). Upon entering doorway, we passed through the two-story Benedict Hall. It had a beautiful ceiling fresco. Coming out of Benedict Hall, we entered the Prelate’s Courtyard. While it is not too noticeable, this courtyard is really a trapezoid rather than a rectangle. The facing wall is a little narrower than the wall of the Benedict Hall. This creates an illusion of greater depth. This is very noticeable when looking down on the model that I made…the Benedict Hall wall is 4 inches and the opposite is 3 ½. On the cornices on each of the four sides are statues of apostles and prophets. In the center of each cornice is an area framed by a round arch. These areas originally contained Baroque frescos representing the four cardinal virtues – Prudence, Temperance, Justice and Fortitude. In 1988 these frescos were replaced with modern symboli sm of these virtues. In this photo we have the western façade which represents Prudence. The large figure is looking into a mirror. The figure on the lower left is reading while the other on the right is listening. The theme is that ultimate wisdom comes from God, whose light shines in the mirror of Prudence. I loved seeing the small gables and chimney which had to be put on with tweezers on the model. There is a fountain in the middle of the courtyard. The original fountain was given to the Abbey in the beginning of the 19th century. It was replaced when the original which was given to the town in 1722. We went through a small passage on the right side into an area where there were restrooms and the imperial staircase to the upper floor. There we entered the museum which was redesigned in 2001 and now features 11 ro oms each with a different theme. It was enhanced with various colored lighting. It was very interesting although we didn’t a lot of time in this part of the abbey. The next stop was a magnificent room called “The Marble Hall”. 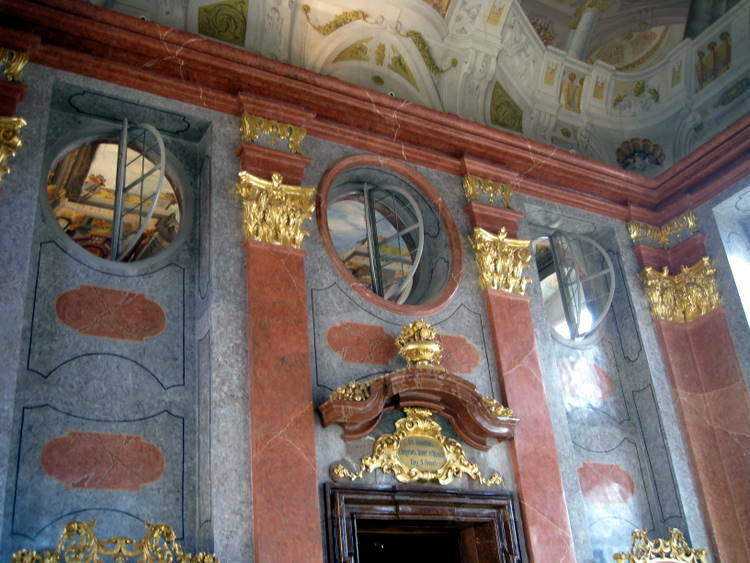 Only the door frames and the inserts over the doors are made of real Salzburg marble. The walls are made of stucco marble, which is a technique of using mud or clay and other materials to simulate the appearance of marble. 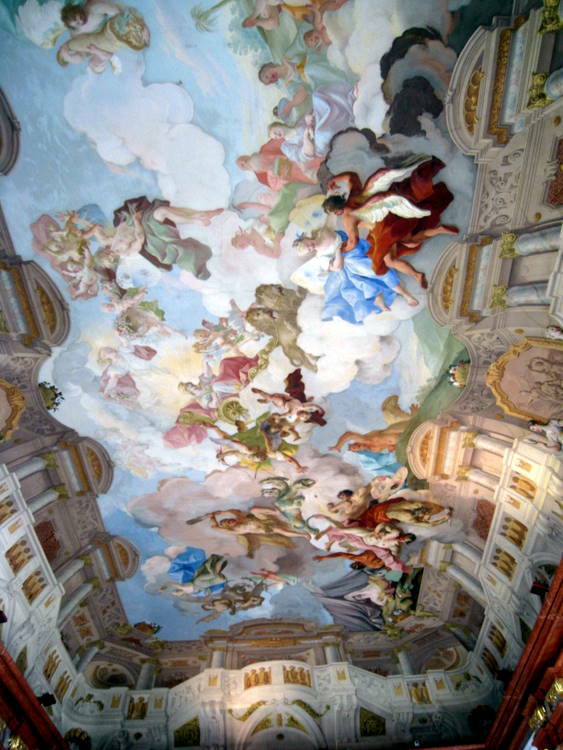 The lovely ceiling fresco dates from 1731. There wasn’t any furniture in this hall. From there we stepped out on a balcony which connects the Marble Hall and the library. 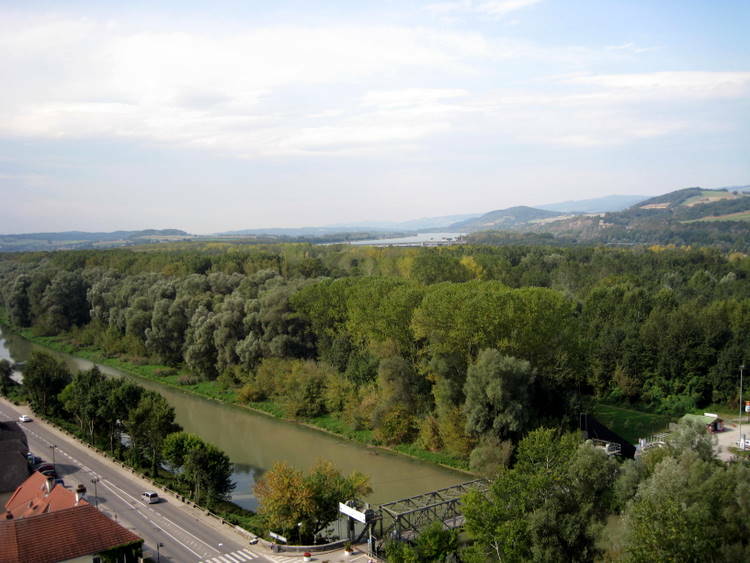 From it there is a beautiful view of the surrounding mountains and the Danube River. We could also look down on the town of Melk. With our back to the view, we were facing the abbey church. The doors to the church were on the level below. Following the balcony around we came to the library which parallels the Marble Hall. 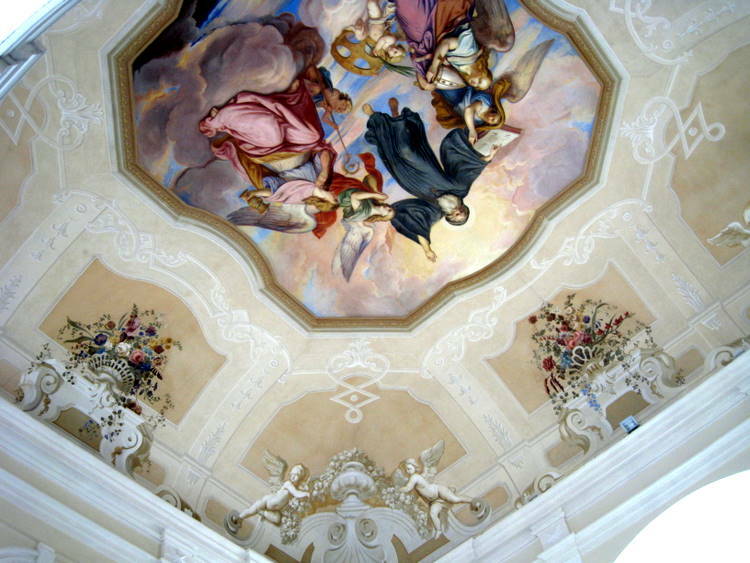 The ceiling fresco is a counterpoint to the painting in the Marble. 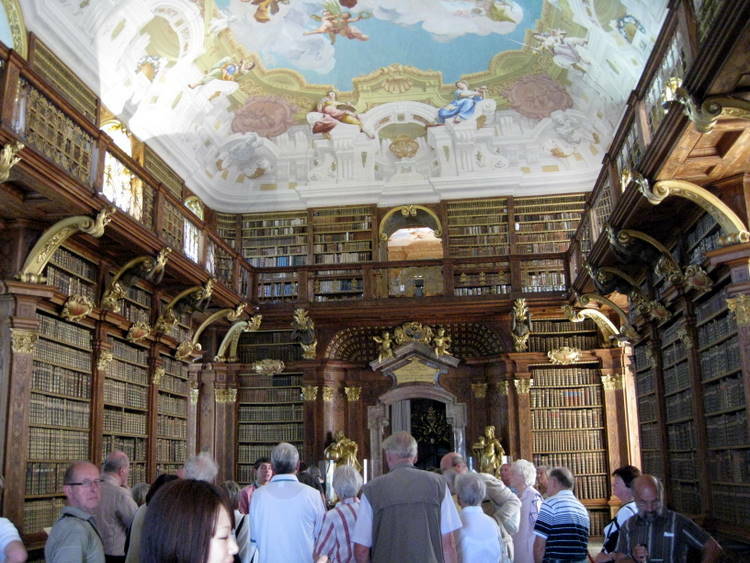 The Abbey has over 100,000 volumes with about 16,000 of these on the shelves of this library. The abbey had own a Gutenberg Bible but they sold it to Harvard University to help financed the restoration of the abbey. Passing through the library and another small room off the main library we went down a pair of circular stars to the church. The church is breathtaking and very Baroque. The architecture of the church, the colors of the ceiling fresco, the stucco marble of the walls and the coloring of the gallery walls capture your senses immediately. 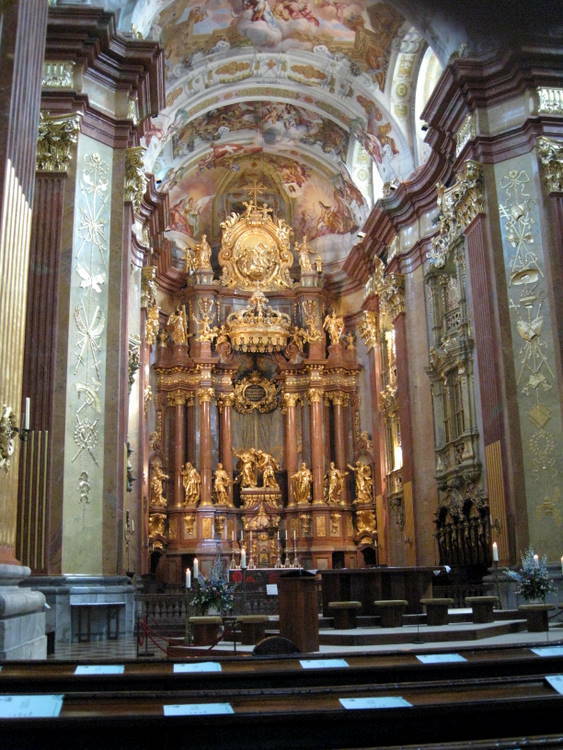 The altar was made of Salzburg marble and gilded wood and gold. High up over the tabernacle are eight statues. The two center ones are Peter and Paul shaking hands in farewell. The other figures represent Old Testament prophets. Above the statues is a huge crown and above the crown is God the Father on His throne. We were there for the noon day prayers which included some beautiful organ music and some hymns. We walked out on the lower terrace in front of the church and beneath the balcony above. We retraced our steps to a large outdoor/indoor café which was located outside of the abbey walls. We ate outside. I had two frank fritters and my wife had goulash. We had learned from our server that a taxi would come to pick up people and take them to the boat since it was some distance. Our waitress graciously called the taxi. We went to a small parking lot and met the taxi. It was a beautiful Mercedes driven by a very well dressed, attractive lady. She took us through the town to the boat landing. We found the boat and wandered around the area where we could look up at the abbey. My photos were not too good because the sun was in the wrong place. 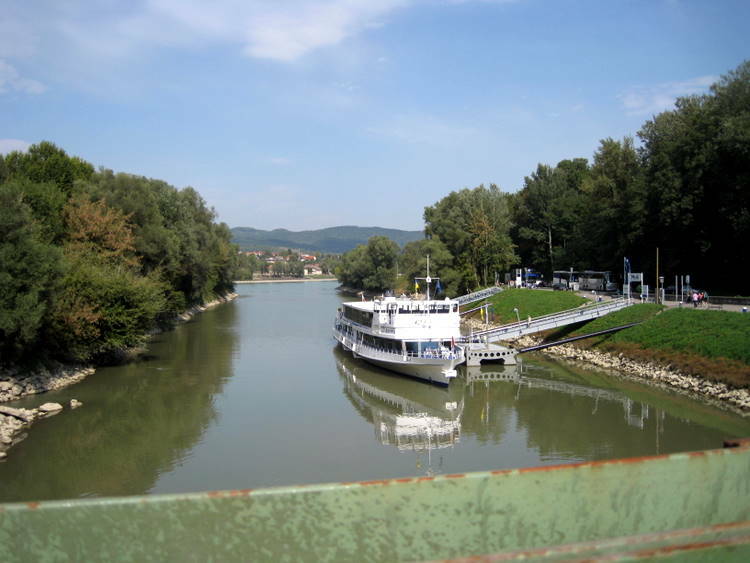 The boat ride was for two hour on the Danube. It was a large boat and we sat outside for a while, but it got too hot so we went inside. It was a beautiful day and we are very glad that we decided to come today instead of tomorrow when rain was predicted. They served drinks and food on the boat. We passed several interesting towns and castles. We made a brief stop in the town of Durstein. High upon a hills is of the ruins of the castle in which Richard the Lionhearted was imprisoned after the third crusade in 1198. 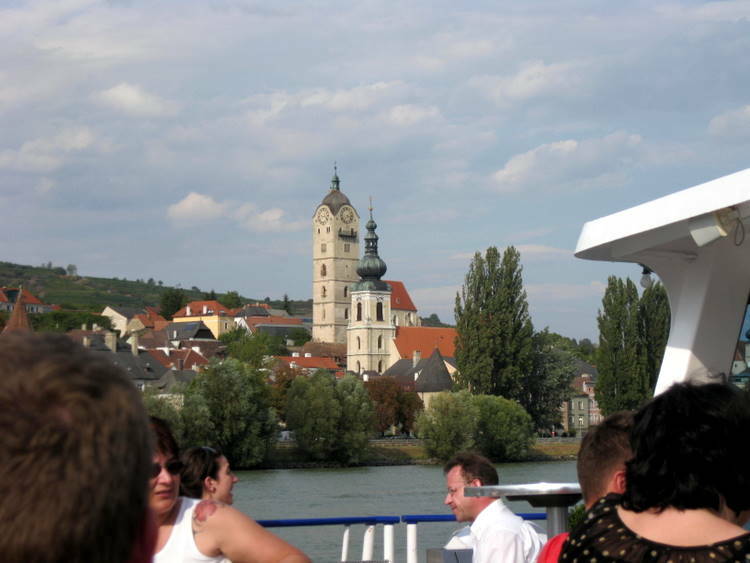 The boat trip ended in a little town named, Krems, where we were to catch the train back to Vienna. Someone told us that the train station was a 15 minute walk, but it took us over ½ hour as the signs pointing to the train station would disappear. We kept asking for directions. There weren’t many English speaking people around. This was a different train line than we took to Melk. It stopped at another train station in Vienna which is just a few blocks from where we lived. There aren’t many places to eat in our neighborhood, and those were closed because it was Sunday night. At the train station there was a McDonalds so we had another McDonalds gourmet dinner. We got back to our apartment at a little past 7:30. It was a great day but exhausting.